Those of us out on the eastern side of the United States are currently experiencing quite a snow storm. While this sort of storm would probably have not even made the local news in Rexburg (where my wife and I attended university), everyone is making a big deal about it around here. Part of that big deal included the option, and even recommendation, that we work from home on Friday, using the company VPN to take care of our tasks. I was pretty excited at the idea of working from home once again (my last job was almost exclusively a work-at-home gig), so I made sure I was able to connect to the VPN a few days ago, after receiving the credentials. It took a few tries to get everything right in Windows, but eventually it started working quite well. Then I tried connecting from Linux, using the awesomeness known as Network Manager. Since I'm currently on Fedora 12, all I had to do was make sure that I had network-manager-vpnc installed, and I could then configure a connection using the same credentials I used in Windows. I had a successful connection on the very first try, and it was working fabulously. I had access to all of my development machines and all of the tools I use on a daily basis. It didn't take long, however, for me to notice a big problem: no Internet access. I could get to any machine I dang well pleased on the company network, but nothing on the Internet. Quite frustrating, to say the least. Right click on the Network Manager icon in the system tray, and select "Edit Connections..."
Connect to your VPN, and enjoy access to the devices there as well as on the Internet! This entry is more of a personal nature than technical. I owe my visitors an explanation for the lack of activity on my part for the past few months. I plan on describing what has been occupying so much of my time, and also addressing what I plan to be doing to occupy my time in the near future. First of all, our little baby boy was born last month, on the 8th of August. It has been a treat to have him finally join us, and I spend quite a bit of time with him. I currently work from home, so just about any chance I get I run over and play with Logan for a few minutes. It's great! Much of the past month and a half or more has been spent adjusting to the new lifestyle with an infant and working from home. It's very easy to get distracted. Another part of the past several months has been spent searching for new employment. I graduated from Brigham Young University-Idaho in April 2009 with a BS in information systems and a minor in accounting. My wife and I have been looking at jobs since before I graduated. With the arrival of our son, the quest became a bit more urgent (we were uninsured). It got to the point where it wasn't unusual for me to be applying to between 5 and 10 jobs a night. After more than 6 months of searching and applying to probably close to 100 jobs, things finally got a little more interesting. A couple of weeks ago, I began doing my traditional job search/application routine. I saw a posting for a Python developer position, and the description sounded right up my alley. My first thought was, "Oh, I'll never get that--it's too good to be true. It sure can't hurt to apply though!" So I did. I shot my resume off to the specified e-mail address and went on looking for other new positions. I was looking at jobs until about 5am that night (starting at about 8pm the previous day). My wife finally convinced me that I needed to get some sleep. I woke up again at 9am, and I couldn't go back to sleep for some reason. I had an unsolicited email from some contract position in Arizona in my inbox when I woke up. I kindly wrote back, informing the individual that my wife and I were more interested in permanent options. Then I got out of bed and described that exciting part of my morning to my wife. A few minutes later, I looked over at my computer, and I noticed that I had a new e-mail in my inbox. I decided to take a closer look. To my surprise, it was a response from the Python developer position I had applied to a mere 13 hours earlier. The message was from the company's CTO, and he wanted to make sure I understood that the job would require relocation. My response informed the CTO that my wife grew up in the area, and that we were definitely willing to relocate (especially considering that this was the first time anyone has gotten back to me about a full-time, permanent position). Only a couple minutes after sending off that reply, the CTO wrote back again to set up a phone interview. Having only been awake for just over two hours, after a 4-hour nap, I was very excited about the progress of my day thus far. The phone interview seemed to go very well. It lasted a solid 40 minutes. I actually really enjoyed the interview, which is really saying something because I abhor telephones. But my interviewers were very nice and easy to talk to. The interview consisted of several questions to gauge my understanding of various things, including Linux, Python, and MySQL. The questions were all very fun for me. Thankfully, I was able to respond relatively clearly, or at least clear enough for those on the other end of the line to get a decent feel for what I know. Only a few minutes after the interview concluded, I received another phone call from the company. They set me up with a flight for the following Monday (the interview took place on a Friday), and booked a king suite in a fantastic hotel for me to stay in. This was all within about 16 hours of sending my resume to the company. I flew out of Idaho Falls on Monday afternoon and arrived at the hotel around 10pm at night. I set three alarms (I'm a deep sleeper) to make sure I'd wake up with plenty of time to make it to the office, chatted with my wife for a bit, and passed out. The bed was amazing after being on an airplane for half a day. Tuesday morning, I headed out to the office at about 9:45 for my 10am meeting. I arrived a little early and had enough time to meet some of the great people there. It wasn't long before I found myself in the CTO's office, starting the real interview process. We spent the rest of that morning and several hours of the afternoon in a grill session. The CTO and lead developers grilled me all over the place, asking very interesting questions. I felt like I had wasted their time and money, because I could not formulate very acceptable answers to several of the questions. There were several questions that I had to answer flat-out, "I don't know." It was a very stressful morning. I think if I were in their shoes, I probably would have booted me out the door. Though, I do have to say, I feel like I learned more about Python and MySQL from those few hours with the developers than I had learned in a very, very long time. These folks are very intelligent. After all of that, the CTO, the two lead developers who were grilling me, and I all went out to eat. We ate some delicious food, had some fun conversations, and then started to talk about the benefits package that the company offers. After lunch, we returned to the office, played a little guitar, and then the CTO called me into his office. He handed me an offer. It was far more generous than my wife and I had hoped, so I accepted it on the spot. He and I discussed a few things pertaining to my new job, and he then dropped me off at my hotel. I spent the rest of the evening trying to wrap my mind around what had just happened and sharing the news with all of my friends and family. I begin work for ScienceLogic, LLC as a Software Architect on the 5th of October. I immediately submitted my official 2-week notice when I arrived back in my hotel room. When I returned home, my wife and I had to scramble to get everything set for how and when we were going to move. We are going to be driving out to Virginia on Tuesday, the 29th of September. It's about a 2,200-mile drive. So. There you have it. We had a baby, I got a new job, and we're in the process of moving. Oh, and one other exciting bit of news. Packt Publishing has asked me to review one of their Django books! I have received the book, and I will read it and post my review as soon as things settle down a bit more. Stay tuned! Just a quick note to spread the news as far as possible: Django 1.1 has been released! Hooray! Excellent work everyone! For more info, see the Release Notes. Last night I noticed that Google Code is actually offering the Mercurial project hosting that they promised back in April. I guess it's been around for most of May, but I never saw any news to suggest that it was actually public. As soon as I noticed it, I converted one of my less-known, less-used SVN projects to Mercurial. I'm really liking it. I need to do a bit more work on this particular project before I announce it to the world, but it's out there, and it's Mercurial powered now babay. I think I will be leaving most of my other projects in SVN so I don't upset all of the other people who actually use them. Oh, I also noticed that the project quotas were bumped up quite a bit. Now each project seems to get a whopping 1GB of space for free!!! What do you have to say about that, BitBucket/GitHub/Assembla/[insert dirty, rotten free open source project hosting host name here]?! 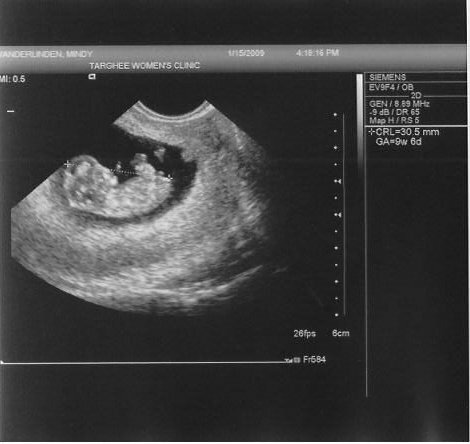 So Mindy and I went in for the first official ultrasound today. 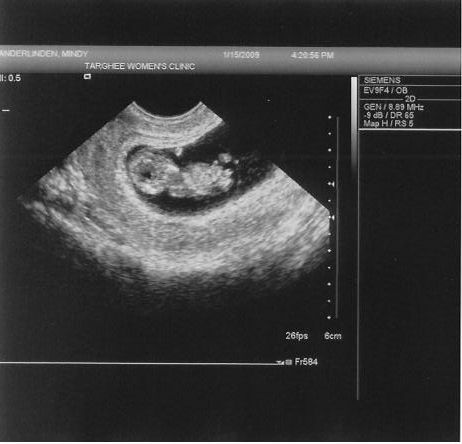 We were quite surprised to see our little spec turn into an active little iddy-bitty baby. It was moving around a lot, and at one point we even saw it waving at us! 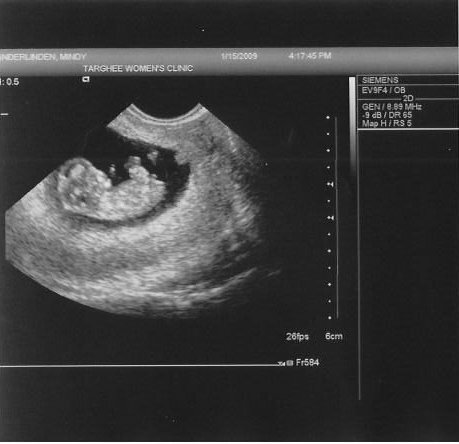 We found out that Mindy is pregnant around the 5th of December, and we waited to let people know until after Christmas, when we officially broke the news to the family. We still haven't told very many people, but now that we have some pictures to show off we think it's about time. With all of the movement we saw during the ultrasound, we decided to nickname our baby "Weebl" after the genius Weebl and Bob. One of my good friends has just notified me of some great news in Django land: aggregates are upon us! As of revision 9742, Django includes two new operations: annotate() and aggregate(). Ok, ok, so I haven't actually played with Django's new aggregation functionality yet, but I definitely will!! And I'm sure it will rock. I've made several fun improvements to my Pendulum Django application. Perhaps the most noteworthy for most people is the addition of a default jQuery-powered date picker for adding and updating entries. I was hesitant to make anything like this be required because some people might prefer controls other than the one I chose. However, I tried to make it easy to override this default date picker if you so desire. Hopefully someone will report on how easy/difficult it is. Also, I've added django-pendulum to the PyPI, which is Python's little package repository. You can think of it as an apt-get repository for those of you familiar with Debian/Ubuntu Linux or derivatives. There is a utility called easy_install, which obviously makes it easy to install packages that are found in the PyPI. The command to install django-pendulum with easy_install is easy_install django-pendulum. Good stuff! Last November, a former co-worker and I began brainstorming for a particular site. This site was intended to give people a way to remember quotes that they heard/read/smelled/absorbed/etc without much effort. Soon thereafter, QuoteBoards.org was born. The site has been pretty boring until recently, though it has been performing its purpose since its first launch. Up until a couple weeks ago, we only had one truly "faithful" member. This member, dirid51, added quotes to his QuoteBoard regularly. He held the site record of 52 quotes until one day another member (Puck) blew is 52 quotes out of the water with nearly 150 (genuine, I might add) quotes in one day. I got in touch with Puck, and he shared some invaluable feedback with me concerning QuoteBoards.org. With this feedback, I was able to make several improvements that helped Puck along the way as he added his collection of quotes. Currently, he as 1,002 quotes. Most of these were added within a two or three day window. The reason he's stopped adding quotes is because he's tired of transcribing them from printed documents. With that in mind, I decided it was finally time to begin working on the Firefox extension that I had originally planned to build for QuoteBoards.org when my co-worker and I were initially brainstorming. The purpose of this extension was to make adding quotes from the Web even easier. So, with a few minutes here and there between laundry and such, I was able to build my very first Firefox extension: Quote Grabber. Right now, the extension is marked as "experimental" and requires people to log into the Mozilla Add-ons site in order to install and use it. However, if you're feeling adventurous, you can bypass that requirement by installing it directly from QuoteBoards.org. There are also directions for using it there. I hope that those of you who are reading this find the extension to be beneficial and useful. I had a good time developing it nonetheless. This article has a follow-up for Slackware 12.2. The following are the steps I took to install Slackware 12.1 on my EeePC this past weekend. I hope you find them complete and helpful! Go to the Advanced tab, and set "OS Installation" to "Start"
cfdisk: Select all partitions individually with up/down arrow keys and use the left/right arrow keys to select delete from the menu at the bottom. Hit enter to run the delete command when it's highlighted. cfdisk: Select the new command with the left/right arrow keys and hit enter when it's selected. Make it a primary parition, and have it take the whole SSD (3997.49MB in my case). cfdisk: Use the left/right arrow keys to select the type command at the bottom and hit enter when it's selected. Choose 83.
cfdisk: Select the bootable command from the bottom using the left/right arrow keys. Hit enter when it's selected. cfdisk: Use the left/right arrow keys to select the write command from the bottom. Hit enter when it's selected. Type 'yes' to verify your intent, acknowledging that your previous data will be "gone". Then select the quit command. To reduce write cycles, many people suggest formatting with ext2, which is a non-journaling filesystem. However, many people claim that the limited number write cycles of SSD is not something to worry about. Use your best judgement on this one. Hit OK after the format is complete. Select where you plan to install Slackware from. In my case, it's the DVD. I usually tell it to find the media automatically. Select manual if you know which device your DVD drive is. Mine was /dev/sr0. Wait for the installation to complete. It took almost a full hour with my package selection, leaving me with 485.4MB free on my 4GB SSD. Choose whether or not you want to make a bootable USB... I skipped it. Choose how you wish to install LILO. I chose simple. Choose your frame buffer mode for the console. I chose 640x480x256. Specify any optional kernal parameters. I left this blank, originally, but later learned that having 'hdc=noprobe' increased my disk access speed by about 13 times. Specify whether you wish to use UTF-8 on the console. I chose no. Specify where to install LILO. I chose MBR. Specify your mouse type. I chose imps2. Specify whether or not you wish to have gpm run at boot, which allows you to use your mouse in the console. I chose yes. Give your eeepc a hostname. This can be whatever you'd like. Specify the domain for your network. This can be whatever you'd like as well. Configure your IP address information. I just chose DHCP. Set the DHCP hostname. I left this blank. Review and confirm your network settings. Choose which services you wish to have running immediately after booting. See if you want to try custom screen fonts. I usually don't bother. Specify whether your hardware clock is set to local time or UTC. Select your preferred window manager. I chose KDE. Slackware has been installed! Exit the setup program and reboot. Hit F2 to enter the BIOS again. Set OS Installation to "Finished" and exit the BIOS, saving changes. Reboot into Slackware! The first boot takes a while because of all the initial setup. It is faster on subsequent reboots, assuming you don't add new services (like apache and mysql) at boot. Change a few settings around. Now for installing various drivers. I kind of stopped taking notes after I realized how much fun it was to have Slackware on my EeePC. If you have questions, just add a comment below. Flash & Silverlight - Possible Agenda Behind Them? Being a web developer, I'm often presented with questions about what I prefer to use for building websites. I tend to build websites by hand using a plain old text editor. Obviously there are a lot of other tools that I use in the process of creating an entire website, but the fact that I use a text editor is sufficient information for the time being. Some of the people who ask me about my preferences often ask why I don't use Flash or similar technologies when they learn of my archaic habits. I have my personal reasons, but I recently read an article that presented many interesting thoughts concerning the potential future of Adobe's Flash and Microsoft's Silverlight that make me feel all the better about my decision to not use either one. Many website owners do not feel that they can have a truly "professional" website without having at least one thing done with Flash or Silverlight. Developers often feel that technologies such as these save them massive amounts of time and offer increased functionality. I cannot argue with either of those points in a general sense (I actually used Flash a lot, long before Adobe bought Macromedia). Tristan Nitot, founder of Mozilla Europe, discussed the possibility of these two technologies becoming a problem for web developers in the future. As it stands right now, both companies freely release their respective plug-ins for use all over the world. But what happens if the companies decide to start charging for the plug-ins? Developers already have to fork out an arm and a leg just to be able to create Flash and Silverlight content. When will the consumers be forced to pay as well? Nitot also feels that such technologies are limiting to the open nature of the Internet. He suggests that the next version of HTML will be capable of presenting video and audio files natively, requiring the user to download no plug-ins at all. This idea in and of itself reduces the usefulness of both Flash and Silverlight tremendously, as many websites simply use Flash applications for audio or video playback (think YouTube). If you're a web monkey like myself, this article is worth a read. It definitely opened my mind to a few of the potential problems in the future of the Internet. This work by Josh VanderLinden is licensed under a Creative Commons Attribution-ShareAlike 4.0 International License.